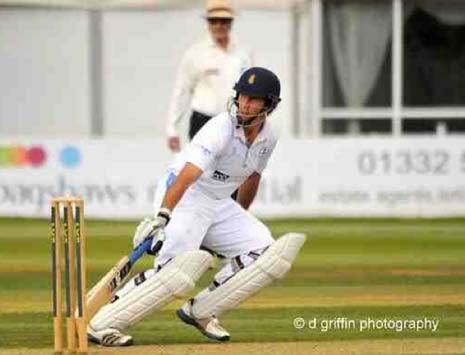 Wayne Madsen became the first man to reach 1,000 LV= County Championship runs this season on Day One against Middlesex at the County Ground. The Derbyshire Captain (below) compiled a superb century, his third century of the campaign, to complete the personal feat on an evenly-contested opening day. The 29-year-old shared useful partnerships with Ben Slater (53) - who completed his second successive Championship half-century - Richard Johnson (33) and Alex Hughes (33) - who hit his career-best first class score. But it was the innings from Madsen, who ended unbeaten on 105, which stole all the headlines and helped his side close on 279-6 at stumps. Derbyshire made a good start despite losing the toss, thanks to openers Chesney Hughes and Slater who added 37 runs for the first-wicket, before Chesney Hughes, who struck three fours, was the first man out for 16. This, however, brought Madsen to the middle and, together with Slater, the pair shared an excellent 81-run stand to move Derbyshire past three figures shortly after the lunch interval. Slater was first to his half-century, striking the ball nicely off the back foot through both the on and off-side to bring up his personal feat off 127 balls, including five fours. His eye-catching innings, however, was ended soon after when he gloved a rising delivery from James Harris behind to John Simpson to reduce Derbyshire to 118-2. Despite the loss of Chanderpaul (2), the hosts developed two more healthy partnership with Johnson (33) worth 56 runs and Alex Hughes - who struck his highest first class score of 33 - worth 66 runs. It was left to Madsen, meanwhile, to completed an outstanding century off 204 balls shortly before the close to round off a memorable day for the Derbyshire skipper, who will resume Day Two unbeaten on 105 and Derbyshire 279-6.